For many, writing is a task done on the computer. You set up a document, and begin to fill the page with letters, backspacing, cutting and pasting, jumping ahead, deleting great sections, adding new ones, etc.. For this type of writing, the computer is part of the body, an extension through the fingertips, connecting the screen to the brain. I like the computer when I’m writing quickly. My typing fingers are able to keep up with my brain when it’s racing in a way no other medium can really match. Often, the word processor is thought of as an advancement of the typewriter, but I can’t imagine ever feeling as immediately connected to the page through a typewriter as I do through a computer. To me, a typewriter is for slow, precise writing. You want to avoid mistakes, think things through, carefully consider the flow of thoughts and wrangle them into something neat and clear. I love typewriters because they break the immediacy of writing that a computer allows, and force me to filter my thoughts, slow them down. It gives me time to subvocalize the words, and place them with care. I could use more of this – it’s too bad my only typewriter is a broken vintage monster I found in the basement of a row home in West Philly. But my absolute favorite way to write is with a nice pen in a fancy notebook. Never do I feel more connected to the words on the page than when I put them there by hand. I prefer inky pens (I’m sure there an official name) on Moleskine lined notebooks. I’ll deal with a ballpoint pen and napkin when it’s the only option, though I prefer writing that leaves no indent into the page. I feel like I can move faster. Putting pen to nice paper combines the two options listed above – I feel the immediacy of typing as my thoughts are one with the ink left on the page, but the inability to delete, to cut and paste, to rework thoughtlessly slows me down in a way that is similar to the type writer. I edit by crossing things out and putting notes in the margin, and then I simply start again and write sections or ideas afresh. I write through entire chapters, and then I rewrite them, making changes and adjustments as I go, revisiting and reliving ideas rather than cutting and pasting them. Writing with a pen allows me to fly, and it allows me to linger. It keeps my focus pure and present, but allows me to stop and reconsider at the same time. When I write notes for teaching, I always do them out by hand a few times before typing them up. It’s the best way to let the thoughts out of my brain, rework them until they make sense, and then put them back into my mind in a way that feels organic. For Christmas, I got some new notebooks and a gorgeous fountain pen. I’m still learning about it, but I can’t wait to add it to my repertoire. It may even get a post of its very own. The other ingredients I need are a good cup of tea, cozy sweater and an even cozier pair of socks, some sort of scented candle, my reference books, and either a good view out a sunny window, or a bright desk lamp in an otherwise dimly lit room. It’s all about the ambiance. Describes my thoughts exactly. I have a full shelf full of notebooks, each with their own purpose – and of course a dozen or two of the inky pens that show up so beautifully on the paper, if you don’t smudge the ink before it dries. I have a typewriter that I use when I want a change of pace, and of course I have my trusty computer – and a folder for my writing that has been appropriately named a Super Massive Black Hole. It was wonderful to read about your writing processes. Super Massive Black Hole – yes! I have a few of those, in both hard copy and electronic form. I keep the papers in old, fraying, over-stressed folders at the bottom of my book shelves. It’s amazing how we tend to think of writing as such a mental thing, when in reality for many it’s so physical. Thank you for reading! I never underestimate the power of a fancy pen. I do most of my writing at the computer, but I have at times found a notebook useful. I love a good pen and nice paper. It just makes you feel like what you’re writing matters, I think – but like you, I can’t discount the ease and facility of the computer! I need all the tools. I use a note taker app on my phone for those moments when an idea just pops into my head. Sometimea I’ll hash it out later on paper, other times I resort to my computer. There is definitely something to be said for the feeling one has after using a quill style pen and some parchment designed paper. Glad to find another writer who likes fountain pens! Most of the writing I do is first done on paper and then written on the computer. 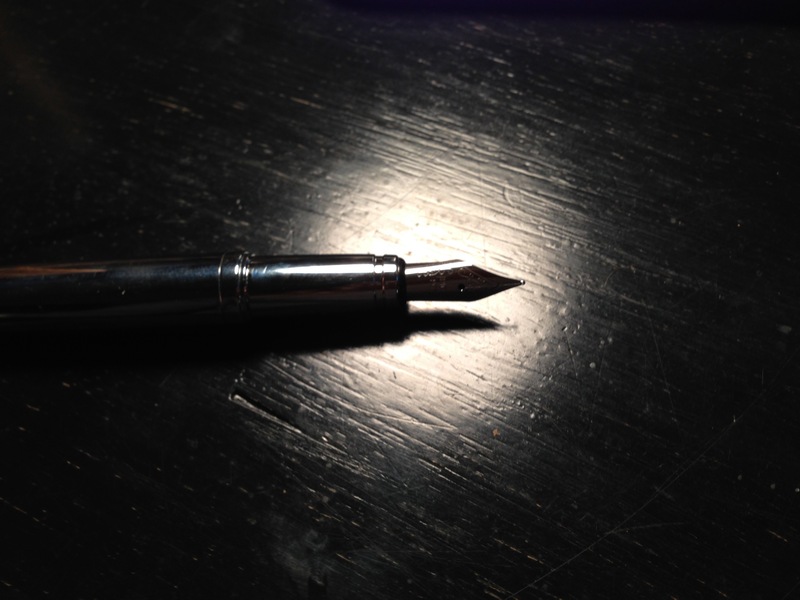 There is something about writing with a fountain pen that makes one’s thoughts come out more freely. I’m still a little new to the fountain pen, but I love it. I’ve been off of ball point and into inky pens for a while, and this feels like the next natural step! You can just move so much more smoothly, so it feels like the words are flowing through you onto the page. What a lovely glimpse into your working life as a writer!